Pinch My Salt has Moved!! 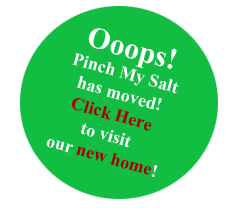 Please visit the new and improved Pinch My Salt here. I´m Marcela from Buenos Aires, Argentina. Let´s see… well, I´m 25, I work as a freelance translator and I found your site through another food blog, though I don´t remember which one at this time. I don’t remember how I found your site, maybe through one of the blog carnivals, but I always enjoy the photos you take, and the fact that you don’t take yourself too seriously! I’m involved in my own blog: http://blog.buckymcoinkumsbbq.com, and website, http://www.buckymcoinkumsbbq.com. I also contribute to http://getyourbrillon.net, http://justbaking.net, http://thecookskitchen and other Well Fed Network blogs. I’m Abby from Oxford,MS and I’m a chemist. I don’t remember how I found your site but now I’m a subscriber. I’m Colleen, from Lawrence, Kansas (Rock Chalk Jayhawk – if you’re from the midwest you know what that means). I can’t exactly remember, but I either found your foodblog via another foodblog or, perhaps, Tastespotting. I, too, have a blog, but it’s a knitting blog, not a food blog. Those Honey Garlic Wings are on my list for this week!! Hi Nicole, I’m Erielle at Fancy Toast. I don’t know if that link worked or not. I live in Chicago. I can’t remember how I found your site, but I really love your photography. Hi Nicole, I’m Erin at http://erinskitchen.blogspot.com. Can’t remember how I first found you–I’m in LA, California. I’m Maggie, finishing up a Master’s in Communications in Philadelphia. I must have found your site through another blog’s links, but I don’t remember which one. I’m in NYC and, yes, they are real. Best of everything and keep ’em coming. Hello from Alanna from St. Louis, the veggie evangelist at A Veggie Venture. Love the idea of a guest book! Hi Nicole – I love your site! Gorgeous pics and great info! Always look forward to seeing what’s new. I’m in Brooklyn, NY and my blog is SugarCookieBrooklyn. I found your blog through My Sister’s Kitchen some time ago and have been a regular reader since. I love your photos and writing! I’m in Illinois and my blog is Fruit Tart. Hi Nicole! I’m Rebecca. I’m from Las Vegas, live in Portland, Oregon, and am finishing my masters in architecture. Love your site, but I don’t remember how I found it! Hi Nicole – I’ve been reading your blog for quite some time. It was actually one of the first blogs I stumbled across, before I decided throw my hat in the food blog ring. Hey Nicole. I am writing from New York. I love food blogs and while one day I might make my own, I love reading others. I never have time to cook anymore so your blog is one of my favorite vicarious food sites! I found your site several months ago, maybe in November/December? It’s a great read! I have a food & life in general blog about living in the south of France. My name is Gisela, I’m portuguese and I’m 30 years old. I found your site on Flickr. I love your photos. My blog is called http://loungebrigade.com and is about crafts, cooking and domesticity in general. At the annual “Spring Reunion”, your grandmother-my Aunt Lou-was bragging and giving your e-address to anyone standing still long enough! We’re all real proud…don’t know anybody else with an address “on the ‘net”. Keep up the good work. This is going to cost a few calories. Pinch My Salt represents the best of the web for recipes. Not only are they easy and delicious, but Nicole’s sweet and bubbly personality shines through her entries. Hi! I’m Megan from NJ, USA. I love to cook, and find your blog to be so inspiring. I think I found the link to your blog from one of the other food blogs that I read, but I don’t remember which one. I made your Naughty Ice Cream Sandwiches for my husband, and they were a HUGE hit – thanks so much for your great recipes! I love your blog–Every time I recieve an e-mail from you, I think how lovely it must be in Sicily–I have only gotten as far south as Positano-I plan a trtip to Sicily one day–I am a gourmet cook-self taught–I love to cook with fresh herbs and avoid using salt this way–if I want some spiceI add pepper–Have a great day. I certainly don’t remember how I surfed on in, but I immediately added the site to my RSS reader, and look forward to every new post. I go by s’kat, but my name is Shelley. I live in Newport News, VA, USA, and am a food writer/photographer/blogger. I don’t know how I found your site, but I love it and visit regularly! I live in San Pedro, CA. Not much of a cook…but love to read your blog and see the beautiful pics. And… being an old friend–I know your good cooking is genuine since back in the day when we were younger. You can make noodles and butter taste gourmet. Love your site Nicole!!! Miss ya. I came across Pinch My Salt through another food blog, although I cannot remember which one, since I look at so many! I enjoy your recipes and images. Very nice! I have a baking blog called Sweet Mary which includes recipes, stories/images from culinary school, a few reviews, and some interviews. Hi Nicole, I found your blog by visiting other sites and they had you listed as their favorite. I live in Salt Lake City, UT and I have Italian blood in my family, so your site is a breath of fresh air that feels like coming home. I enjoy seeing your recipes! Keep up the good work! Hi Nicole. I found your blog from the Sacramento Bee newspaper this morning. I live in Citrus Heights,CA. I love to cook and bake. I am intrigued by your site and will visit it more thoroughly at a later time. Hi there! I found you through SU. You really have a good thing going here. Ahh Strawberries I cant wait until the swedish ones are ripe, its another month but there always worth the wait. I live in San Rafael, CA – just north of San Fran. I was looking for a pumpkin/wheat bread recipe a few months ago and found you! I love your site- easy to use and read. Thank you, I love those muffins – now I am cooking the banana bread and put in oatmeal, oatbran and less sugar. It’s fun to experiment! We just moved to Milan for 6 months! I’m enjoying your perspective on the Italian Cucina! Thank you for the beautiful images and some great ideas to give my cooking in Italy experience a kick start!! Found you through link on someone’s site–don’t remember who (sorry!) Love your pics and recipes. “Hi” from West Texas! I am a new food blogger, http://coupleofcooks.blogspot.com/, and love your site. Your pictures are so eye catching and Sicily sounds so beautiful. Keep it up! Seriously, thanks for the comments. I appreciate it!